Container Vegetable Plants - Surprise, Surprise, Surprise! Additionally, most herbs are suited well to container gardening. When choosing container vegetable varieties, you should look for certain key words such as "space saver" or "bush" on the seed packet. These key words are a good indication that the vegetable type is suitable for container gardening. 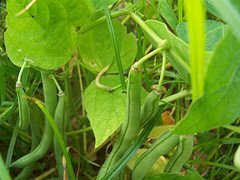 In recent years, more and more compact varieties of other types of vegetables have been developed. There are now bush varieties of acorn squash and butternut squash. There are also sweet corn varieties that have been introduced that are specifically designed for growing in a container. A new trend that we've been seeing more and more is growing potatoes in sacks. We haven't tried this ourselves as we have plenty of space in our traditional garden for growing potatoes. However, we've been asked quite a few questions about this method. One way to grow large vining varieties as container vegetable plants is to set up a support structure so they grow vertically. Most containers wouldn't be big enough to grow cantaloupes in. However, if you put the container next to a fence or trellis and train the vines to grow up instead of out, you can certainly make it work. You can use a wide variety of containers for your container garden. Flower pots, buckets, window boxes, planters, whiskey barrels and wash tubs are all good choices. You're really only limited by your imagination. If you were to find a really big container, you could grow almost anything (Say, for instance, you had an old school bus sitting in your yard. You could take out the seats and cut the top off the bus. Then, after filling what was left of the bus with dirt, you could easily grow pumpkins, watermelons or sweet corn. Now that would be the mother of all container gardens!!). Make sure that the containers you select have holes in the bottom for adequate drainage. If the container you choose does not already have these holes, you can use a drill and create them. 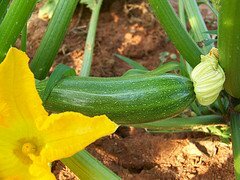 To learn how to grow these vegetables in containers, click on the individual vegetable links listed on the navigation bar on our Home page.